2 ways to work the hours YOU WANT and Make the money YOU DESERVE with Simply Skinny®! ​Buy Wholesale Direct from us, DTES, Manufacturer of Simply Skinny® weight loss products or sign up to be an ​Affiliate Promoter! Make a living with Down To Earth Solutions' Simply Skinny® weight loss products! We offer people like you the opportunity to earn a healthy income by helping others lose weight with our exclusive Simply Skinny® weight loss product line, developed and manufactured for Down To Earth Solutions LLC. Buy wholesale Direct and earn MAXIMUM profits! Join our Simply Skinny® Rewards program as an Affiliate Promoter and earn up to 35% commission without having to have a single product on hand or as an Independent Distributor or Retailer and earn 40 - 50% profit instantly off of every bottle you sell, the choice is yours. Depending on your goals, time and effort, as a Down To Earth Solutions Independent Distributor / Retailer / Affiliate Promoter of Simply Skinny® products your income potential is endless. But more importantly, this means being able to afford things that money can't buy. Work around your own schedule and at your own pace. Build a large clientele base or expand your established clientele base. Travel when you want (without having to request time off from your boss). Engage and build relationships with like-minded customers. If you are self motivated and would like to try a very unique approach to earning a living full time or supplementing your income on a part time basis without ever having sold a single item in your life, here is the opportunity you have been looking for. We are not a MLM, we are a single level direct sales company, meaning that our Independent Distributors are not required to have downlines to earn a healthy income. ​With our Simply Skinny® products, The Proof is in the Results and our products sell themselves. The earning potential is limitless!! Follow the simple steps below to find out more about how to buy direct and start earning a living with DTES or check out SSRewards for more information on the Affiliate Promoter program! You may be contacted via email as a follow-up to your inquiry. 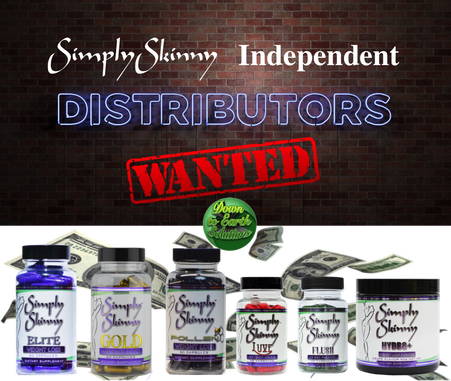 You will not be contacted via phone unless you have contacted us via email (as outlined in the downloaded packet) and would like to move forward with becoming a distributor/retailer of our Simply Skinny® product line. To get your FREE Independent Distributor or Retailer Informational Packet, choose the appropriate package below, checkout and once you receive your email containing the information, download the Independent Distributor / Retailer informational files. Follow the steps outlined in the packet if you're ready to sign up as Independent Distributor of Simply Skinny® products and begin earning 40 - 50% profit off every bottle you sell instantly.